It’s amazing how many people visit my blog in a vain attempt, no pun intended, to find out how to buy a degree, especially a Ph.D. In addition to “how to buy a phd,” other search engine terms include life experience phd, get a phd based on job experience, buying phd and buy university degrees. 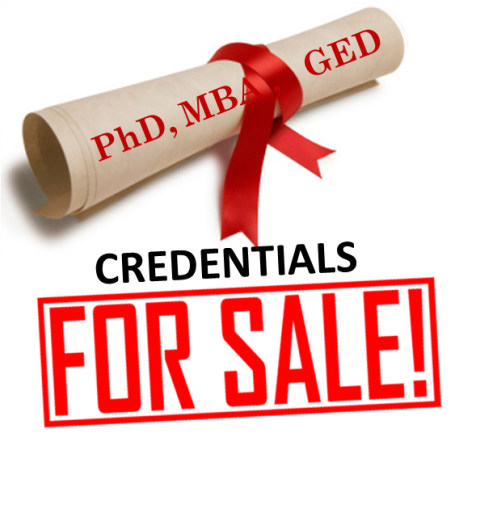 Some want something for nothing, as evidenced by this search engine term: free fake phd certificate. They must be disappointed when they discover that I’m shedding light on this dark and disturbing trend not aiding and abetting it. Why Earn It When You Can Buy It? Why not do it the old-fashioned way? Here’s why, according to this Petersons article, entitled Ph.D. Programs Are Rigorous Educational Experiences: Ph.D. programs — for that matter, any doctoral program — will take years to complete. Depending on what you’re studying and how much time you can put into your studies and dissertation, doctoral programs can consume anywhere from three to six to nine years or more. (The average age of Ph.D. recipients in the US is 33.) Earning a Ph.D. degree can be so time-consuming that many candidates cannot work full-time, and they often live on stipends and fellowships to help make ends meet while they haunt the research labs and libraries. These graduate programs are perhaps the most rigorous educational experience people can have, but when they are complete, the recipients are considered to be individuals who add intellectual and scholarly value to their fields. It’s also mildly amusing and a bit sad that some successful people, including in Vietnam, feel the need to “acquire” a Ph.D. Why not let their accomplishments stand on their own? Why diminish their reputation by claiming to have a Ph.D. that is not worth the paper on which it is printed? In a word: vanity. The Peterson’s article concludes with this upbeat and sobering thought: When all is said and done, you will have accomplished a monumental task. Earning a Ph.D. degree is something that very few people manage to do. It’s estimated that only about 1 percent of the U.S. population has a Ph.D. Is that any wonder, given the amount of work — and brains — that must go into Ph.D. programs? Given that 57% of students who begin a Ph.D. program in the US will complete their degree within 10 years, meaning that 43% will not (e.g., eternal ABDs – all but dissertation), what does it take to meet this formidable academic and personal challenge? It helps to be reasonably intelligent but intelligence alone won’t push you over the finish line. Recommended qualities include hard work, dedication, patience, perseverance, tenacity, and cogency. Oh, did I say hard work?